Every time I have the opportunity to throw a party of any kind, I cheerfully and confidently sift through Pinterest, saving scores of gorgeous images of professionally planned parties, thinking: "I can do that!! It'll be perfect!" Then somehow down the line it ends up being blue letters on paper doilies in front of crocheted blankets...hmm. But! 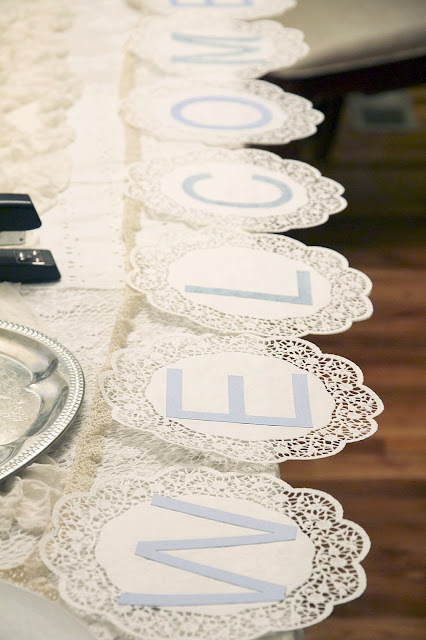 Since most of you probably aren't professional party planners, perhaps you can take away an idea or two anyway. I used my silhouette to cut the letters for the banner, but you could use stencils, too! 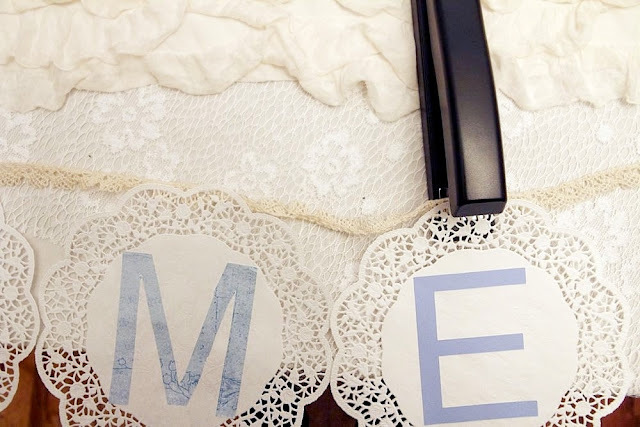 I glued them to the doilies and stapled them to antique white lace trimming. Side note: I thought I invented this idea, but apparently it's all over Pinterest. Story of my life. 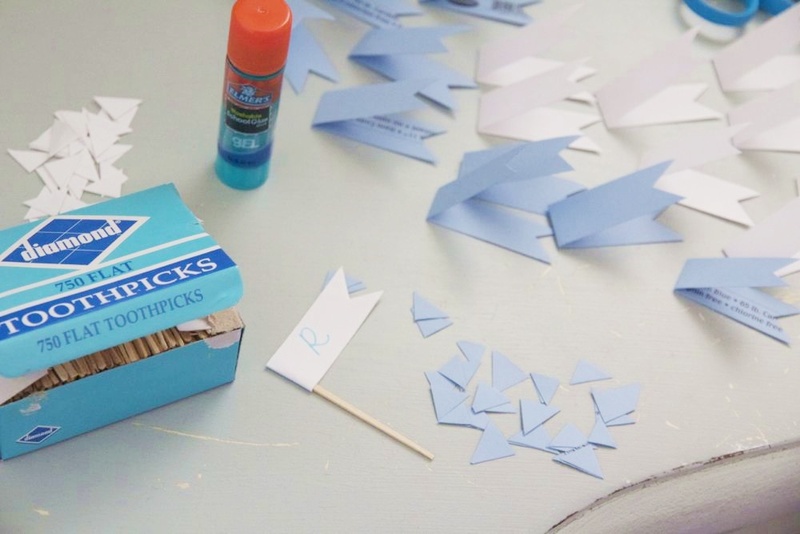 Little paper flags--not a new idea, but nice and easy! We drew "R"s on them for "Ryan". Just cut a long(4"?) rectangle, fold in half and snip a triangle out of the side. Then glue to a toothpick. We put them in the cupcakes that baby Ryan's sister made. To fill a big space on one wall, I tied little blue gift tissue squares to some string and looped my crepe paper into bows. This actually was a pretty good idea, but perhaps a little poorly executed. We did this about ten minutes before the shower started, so they weren't as neat as I would have liked. It's seriously embarrassing to post this photo! But you get the idea. And of course, being a tea party, we had our tea things. I didn't get a photo of all the different tea cups, but they were pretty! I didn't like the ugly tea bag packaging so displayed the different teas in a cute basket. 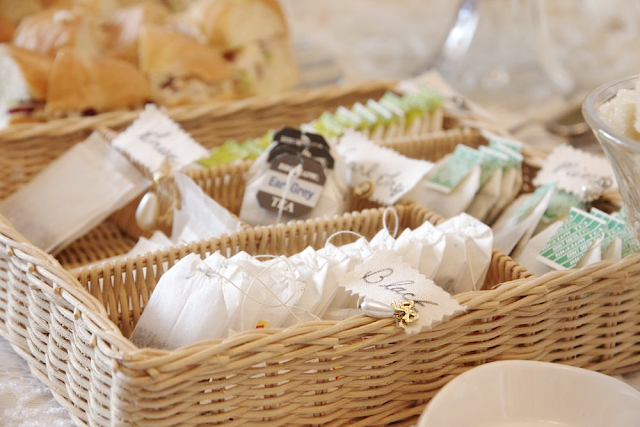 I used pinking shears to cut fabric labels marked with the names of the different teas and pinned them to the basket with vintage earrings. Your decoration looks absolutely gorgeous! 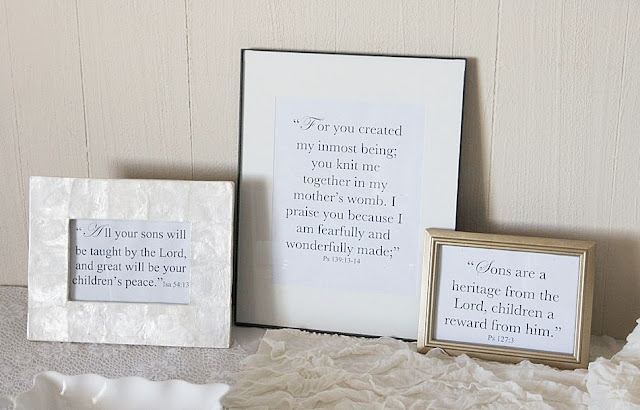 your ideas are always so wonderful, just by themselves, and as I don't spent much time on pinterest, it looks new to me :-) be happy of your accomplishment, I am sure you made a future mom very happy! In my eyes, sites like pinterest are not only there to inspire, but also to advertise, so of course people only show the very best. with photoshop & professional photography. It. Wasn't. Perfect?? ...What kind of crazy, mountain-high expectations do you have?! Girl, it all looks so gorgeous. You did great. Disney, it's looks great! We are always our own worse critic. I am a total party optimist, so I know how you feel! But, it looks wonderful! i think you are too hard on yourself. #1 i think this looks so good!!! and #2 perhaps the pinterest parties didnt have budget restraints. Adorable!! You're way too hard on yourself! I love the verses you used, too! I think it turned out darling! Very creative! Much better than I could ever do! Everything looks lovely. I'm also very curious about your black wall...is it chalkboard paint? Haha, my sister and I do the exact same thing. 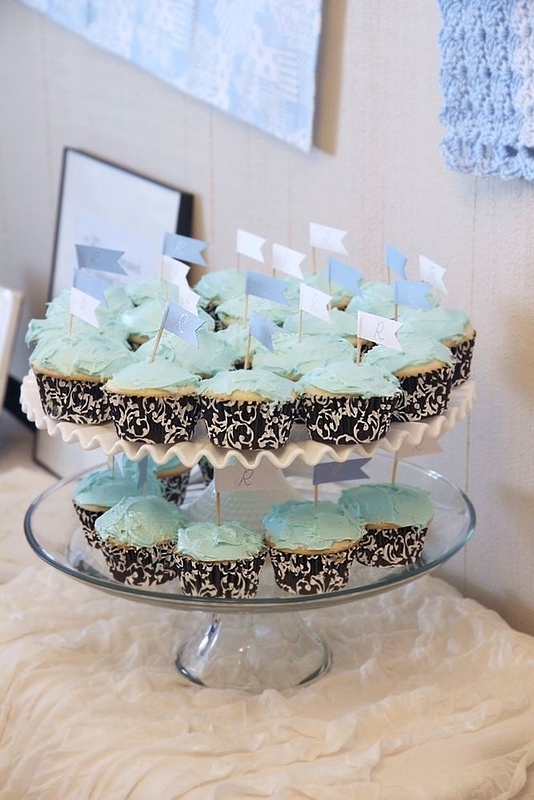 I threw her baby shower last month, and I lamented, "Is it too much to ask that we be able to pull off a Pinterest party???" Pinterest has absolutely given me unattainable expectations lol. 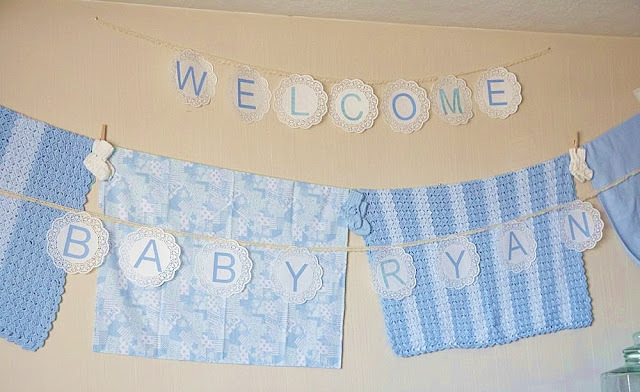 It's a beautiful baby shower Disney, I wish you could have thrown me one, they are not so big here is the UK so I threw my own minus the beautiful decorations. It looks great and even better than a "designer" party. It has heart and soul and love - especially the cupcakes make by the baby's sister. I'm sure the new mom was absolutely thrilled to have her precious baby welcomed with such love and care! Disney, your party was beautiful. I am sure that the new mama was blown away by it and felt very cared for and that is what really matters! I have three boys and have spent the past decade doing boy parties. Hoping for some granddaughters some days so I can smother them in pink tutus and baby dolls! It still baffles me that a girly girl like me as all boys!!! 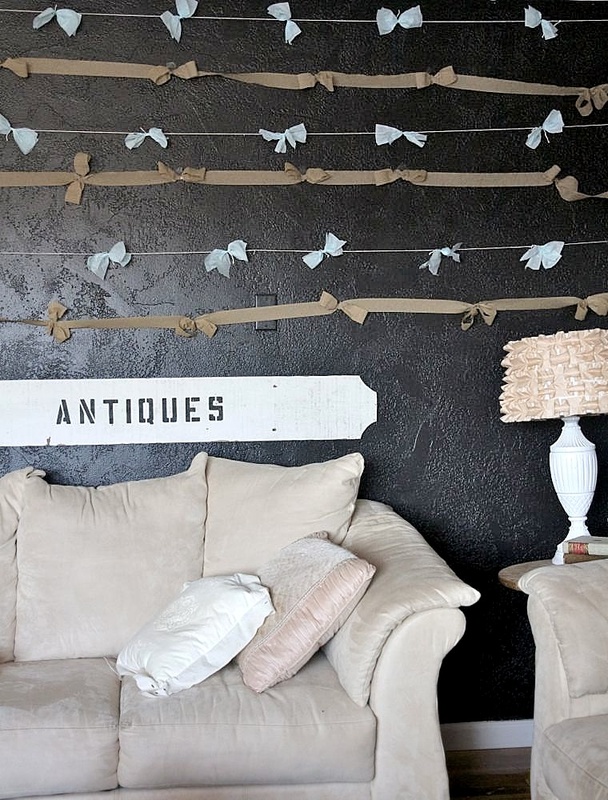 I totally thought the ribbons on the wall was a Pinterest photo until you said something. 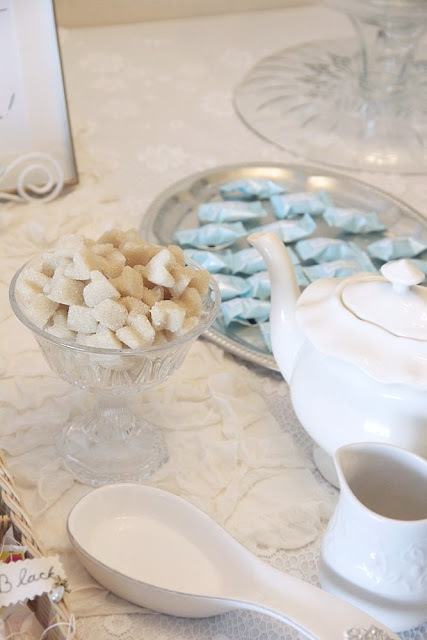 And I LOVE those sugar cubes too! It was a pretty good imitation of the picture above. It's not as good, but it is not suppose to be since you put your own spin on it and 'cause you copied it for a reason. I'm sure that baby's mama was grateful regardless of how the party looked. It's obvious you spent time doing it. 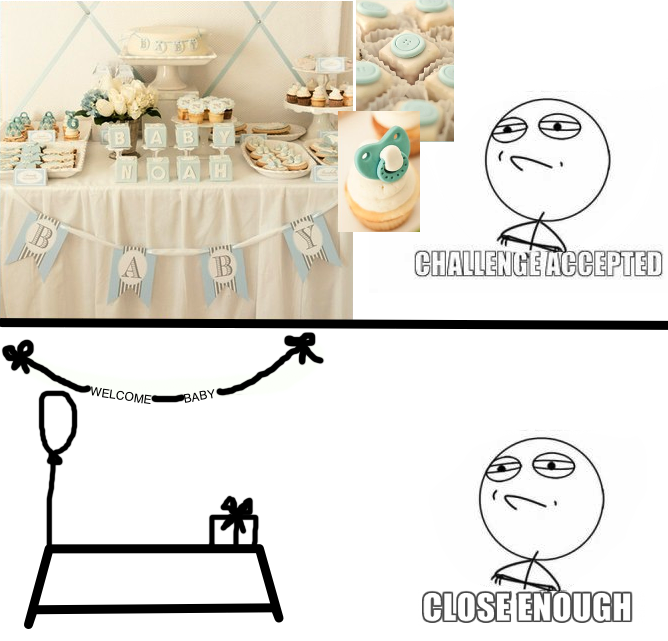 So be optimistic and you'll do a better job when you finally do a girl baby shower. That's soo me! I do exactly the same thing every time. I think your party turned out lovely though. The little sugar cubes are adorable! I completely and 100% feel exactly the same way when I want to do a party! It is never like what I pictured in my head..but..it doesn't have to be perfect to be beautiful! (Nester)They all probably had a great time-that's what she'll remember. Thanks for posting -love the ideas! I completely understand what you went thru! I do that to myself ALL. THE. TIME. I have these HUGE expectations, and bust my behind trying to execute what is envisioned. However, between lack of time & money it almost never turns out completely how I've planned. On that note ... I have been able to plan both boy & girl showers, each one a different theme, but I really LOVE what you've done here! I never thought to make ties for garland, let alone to have a tea party. It's nice to remember the mom too. From the pictures you shared, it appears that you planned a very quaint and nostalgic type shower. It was dainty enough for a group of ladies, yet still very boy for a baby. A very nice mix. As a few of these ladies have said, we are our worst critics and definitely harder on ourselves. Just remember, everytime you have the ability to throw a party (whether shower or any other) the thrill of excitement & gratitude on the Honored Guest is the greatest & best feeling!